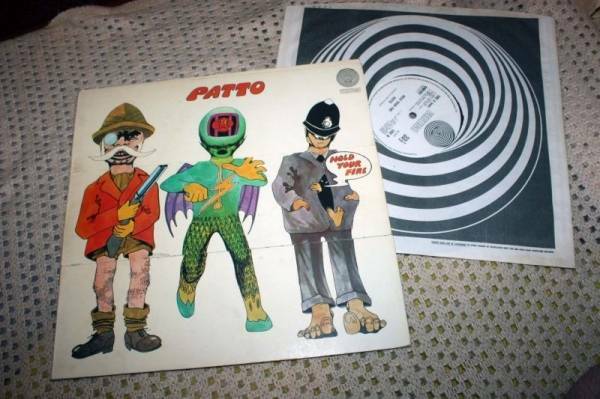 PATTO - HOLD YOUR FIRE - RARE UK ORIGINAL ROCK PROG LP 1971 VERTIGO RECORDS 6360 032 ' VERTIGO SWIRL'. GIMMICK GATEFOLD COVER AND SWIRL INNER BAG. VINYL IS IN NEAR MINT CONDITION . SLEEVE IS IN VERY GOOD CONDITION, SHOWS SIGNS OF WEAR ALONG THE SPINE, SOME COLOUR LOSS ON THE INNER PART OF THE FOLDOUT FLAPS.